At least Pocky is for women, as evidenced by Men's Pocky - to make sure men don't eat the other flavors. Hurrah! I love it. Signs, you have (once again) made my day, and so early in the morning as well. I also adored the way these Very Special Pens had brought out the creative instincts of the Amazon commenters. PS I totally love Pocky sticks, too. Where do I get the "mature" version? Zhoen, thank you for this - I can picture myself eating Pocky while penning my magnum opus (or shopping lists). Anna, obviously you can't have the "mature" Pocky as they are for the men. I would have gone for those too, but why rock the boat? Have the banana flavour and rejoice. We hot-foot it to Amazon as fast as our little feet can go. Sometimes life is just so simple. I saw these too and was guffawing into me sleeve ....until I remembered that in the 70s at school, when we all wrote with fountain pens, all the main brands, Platignum, Sheaffer, Parker etc etc always made a lady-version of each design. Obviously nothing has changed ! 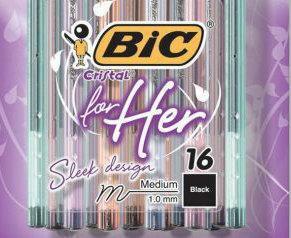 Cusp, yes, you are right - how could I have forgotten the lady-version fountain pens? So this is perhaps a step back as well as a step forward? I need to think about this. I have a strange and dangerous urge to actually buy some. What the hell is wrong with me?! Jesus! I just noticed the price! It isn't just you, Amy - I have the urge too. And I can almost guarantee that Anna has. Clearly they identified a need. Oh, and congrats for getting past the robot police! You guarantee correctly, Signs; I am positively dying for a packet of those pens. I am prone to other Devil's Work as well, though, Cusp (hello, happy new year, all that), so your theory may also hold. At least to a degree. Yes, there are Lady Parkers and things…but they, for some reason, make more sense. I mean, an elegant and feminine design for an elegant and expensive item…a bit like, well, ladies' shoes are designed differently from men's shoes. The same goes for cigarette lighters; there are Zippoesque things aimed particularly at women. I can see my reasoning totally failing at being convincing. But regardless of that, there is a difference between a gorgeous Mont Blanc with an engraved floral pattern – and a plastic Bic biro in pink (you know, in the package, they are reminiscent of nothing as much as disposable razors, don't y'all agree?). There just is. I have watched it and think Anna should too. If that doesn't persuade her of the virtues of LadyBics then nothing will. I have watched and am now Officially Persuaded. Now all I need is A Man to purchase me a package – I mean, I can't be expected to manage online shopping by myself, can I? Surely not. Ah - I think we have a chcken-and-egg situation, Anna. For the Ladypens will surely bestow on you the type of virtues that would guarantee the attentions of a suitable gentleman person - the kind who would see it as his right and proper place to get you those pens, I mean. But without them already in place I am not sure how best to proceed. You need to be seen in the right places, looking helpless. I think. Good luck.